One of the many benefits of living in the northeast is the variety of winter recreational opportunities that are afforded to us. One of the most rewarding of these is ice fishing. It is accessible to young and old alike and the cost to get started can be less than other outdoor winter activities in New York. New York State Parks has a long tradition of promoting ice fishing events with tournaments at many of their facilities. Northeast of Albany, Grafton Lakes State Park Grafton Lakes State Park has been holding a tournament every winter for the past 33 years. This year’s tournament will be on January 19th and runs from 5 am to 2 pm. There will be prizes for the three longest fish of each species–trout, yellow perch and walleye/chain pickerel–for both the adult and child group. It’s a great day of family fun. Thompson’s Lake at Thacher State Park will be holding their tournament two weeks after Grafton’s on February 2nd. For more information about these tournaments contact the Parks. 2017 first place brown trout catch at Grafton Lakes State Park. 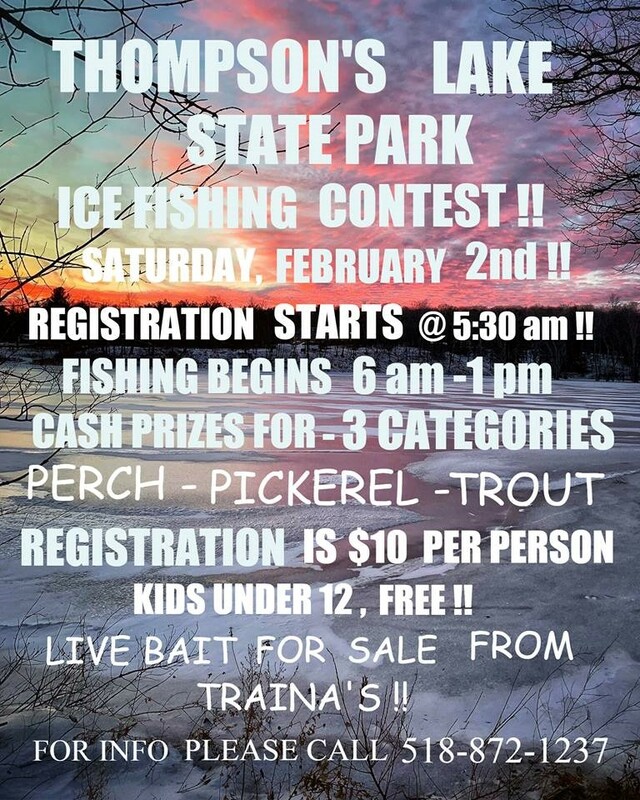 If learning to ice fish is more up your alley, you can try out Thompson’s Lake on January 19th when DEC’s I Fish NY staff will be on hand to offer a clinic and free day of ice fishing. Moreau Lake State Park’s “Ice Fishing for The Kids” program will be on January 26th from 10 am-2 pm. There will be snacks and refreshments offered by the Friends of Moreau in the warming hut. On February 20th Glimmerglass State Park will host the Otsego Lake Ice Fishing Clinic, also free to the public, from 9 am-3 pm. For more information about these events call the associated park. There are many other opportunities throughout the season to learn how to ice fish. Governor Cuomo has designated February 16-17th a free fishing weekend as part of his NY Open for Fishing and Hunting Initiative. No fishing license will be required for those partaking over this weekend. Beginning ice anglers are encouraged to download the Ice Fishing Chapter (PDF, 3.7MB) of DEC’s new “I FISH NY Beginners’ Guide to Freshwater Fishing” for information on how to get started ice fishing. Additional information, including a list of waters open to ice fishing, can found on the DEC ice fishing web page and the Public Lakes and Ponds map. Crappies are a common ice fishing catch. When ice fishing, please keep in mind that anyone 17 years and older needs to have a fishing license in their possession (except on designated free fishing weekends). Fishing licenses are valid for 365 days from date of purchase. If using live bait, it must be certified, and excess live bait can never be discarded into a waterbody. This prevents the spread of diseases and invasive species. Of utmost importance is safety. Do not go on ice that is less than 4 inches thick and be especially wary of ice on moving water like streams or rivers. Ask the experts and don’t go alone. Remember that tracks left by others is not an indication of safe ice; conditions can change quickly. Areas near docks and shorelines may be less safe. If you follow these simple guidelines and dress appropriately, you and your family and friends will be able to enjoy a fun filled day of fishing and fresh air. Always keep in mind that ice fishing is a weather dependent sport and you need to be aware of the conditions. State Parks loves to see pictures of your adventures out on the ice — be sure to share them with staff at your favorite State Park. Happy Fishing! Remember to dress for the weather for your fishing adventure.